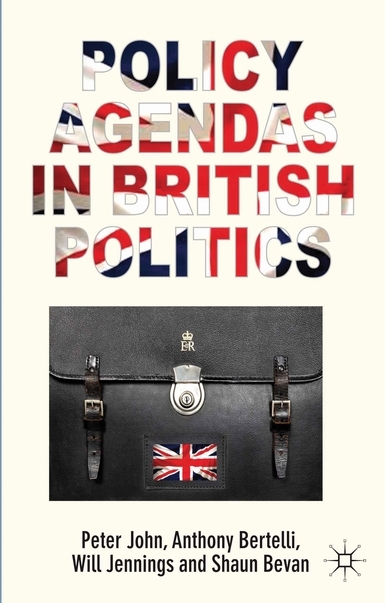 Our book, Policy Agendas in British Politics, is published by Palgrave Macmillan today. It traces the attention of British government to different policy topics since 1945, showing how issues such as the economy, international affairs, crime and immigration have risen and fallen on the agenda. The book throws new light on the key points of change in British politics, such as Thatcherism and New Labour. Building on existing approaches to agenda-setting (incrementalism, the issue attention cycle and the punctuated equilibrium model) it develops a new approach labelled focused adaptation whereby policy-makers respond to structural shifts in the underlying pattern of attention. We have now completed the redesign of http://www.policyagendas.org.uk, hosted on WordPress, and have published all the completed datasets and codebooks from our ESRC-funded project, as well as all the relevant project reports and published outputs. If you have any questions about the website or its content, please contact Will Jennings.